Recent studies suggest that FGFR3 is a potential therapeutic target in urothelial carcinoma (UC). The purpose of this study was to evaluate the rates and types of FGFR3 aberrations in patients with muscle-invasive UC who received radical resection. We analyzed surgical tumor samples from 74 UC patients who had received radical cystectomy (n = 40) or ureteronephrectomy (n = 34). Ion AmpliSeq Cancer Hotspot Panel v2 and nCounter Copy Number Variation Assay were used to detect FGFR3 aberrations. Fifty-four patients (73%) had high-grade tumors, and 62% had lymph node involvement. Sixteen patients (22%) harbored FGFR3 alterations, the most common of which was FGFR3 mutations (n = 13): Y373C (n = 3), N532D (n = 3), R248C (n = 2), S249C (n = 1), G370C (n = 1), S657S (n = 1), A797P (n = 1), and 746_747insG (n = 1). Three additional patients had a FGFR3-TACC3 rearrangement. The frequency of FGFR3 aberrations was higher in bladder UC (25%) than in UC of the renal pelvis and ureter (18%) but the difference was not statistically significant (P = 0.444). Genes that were co-aberrant with FGFR3 included APC (88%), PDGFRA (81%), RET (69%), and TP53 (69%). We report the frequency and types of FGFR3 aberrations in Korean patients with UC. Patients with FGFR3 mutations or FGFR3-TACC3 fusion may constitute potential candidates for a novel FGFR-targeted therapy in the perioperative setting. Urothelial carcinoma (UC), a cancer involving the transitional epithelium of the urinary tract, is the seventh most common malignancy in Korea . The majority of cases arises in the bladder, whereas only about 5 to 10% occurs in the upper urinary tract including the renal pelvis and ureter . Because of the relative rarity of upper tract urothelial carcinoma (UTUC), clinical decision making for patients with UTUC depends on data available for urinary bladder urothelial carcinoma (UBUC) . For metastatic or advanced UC, platinum-based chemotherapy is considered standard treatment. There is a need to develop new therapeutic options focused on the molecular aberrations driving UC, as patients who fail to respond or have progressed after platinum-based chemotherapy have a grim prognosis. Recently, molecular analysis has identified subsets of UC expressing distinct molecular signatures. Genomic alterations in the fibroblast growth factor receptor 3 (FGFR3) are well described in UC and have led to extensive clinical investigations evaluating FGFR3 inhibitors . FGFR3, which belongs to the family of tyrosine kinase, is responsible for the FGF signal transduction. FGFR3 signaling is involved in development, differentiation, cell survival, migration, angiogenesis, and carcinogenesis . The most common types of FGFR3 aberrations in UC are activating mutations, followed by gene rearrangements and amplification [6, 7]. FGFR3 mutations are predominantly found in genetically stable UC , and have been associated with oncogenic progression in UC . FGFR3 gene rearrangements generate constitutively activated and oncogenic FGFR3 kinase protein products, and cellular dependence on these drivers confers sensitivity to selective FGFR inhibition [10, 11]. Furthermore, studies indicate that FGFR3 mutation status could be used to guide anti-FGFR3 therapy . However, previous molecular studies were performed mainly in patients with UBUC. Data on FGFR3 aberrations in the UTUC, particularly in the muscle invasive type, are not yet sufficient. Based on these considerations, this retrospective study aimed to evaluate the frequency and types of FGFR3 gene aberrations in radically resected UC. We also compared the frequency of FGFR3 alterations between UBUC and UTUC. This study is a part of the Samsung Medical Center (SMC) Oncology Biomarker study (ClinicalTrials.gov identifier: NCT01831609). Tumor samples were collected from 74 consecutive patients with UC who underwent radical cystectomy or nephroureterectomy between 2012 and 2014, and had adequate specimen for molecular analysis. All patients provided written informed consent for the use of tumor tissues as well as their clinical data. This study was performed in accordance with the Declaration of Helsinki and approved by the Institutional Review Board of SMC (Seoul, Korea). Our dedicated genitourinary pathologist (G.Y.K.) reviewed all pathology specimens to ensure the samples contained > 80% tumor cells with < 20% necrosis. Genomic DNA was extracted from the primary tumor tissues using a QIAamp DNA Mini Kit (Qiagen, Valencia, CA, USA). After extraction, we measured concentration as well as 260/280 and 260/230 nm ratio by spectrophotometer (ND1000, Nanodrop Technologies, Thermo-Fisher Scientific, MA, USA). Each sample was then quantified with the Qubit fluorometer (Life technologies, Carlsbad, CA, USA). Genomic DNA with > 10 ng measured by Qubit fluorometer was subjected to library preparation. We used the Ion Torrent Ampliseq™ cancer panel v2 to detect frequent somatic mutations that were selected based on a literature review. This panel examines 2855 mutations in 50 commonly mutated oncogenes and tumor suppressor genes (Additional file 1: Table S1). We constructed libraries using 10 ng of genomic DNA with the Ion AmpliSeq Library Kit and Ion Xpress Barcodes (Life Technologies). For barcoded library preparations, barcoded adapters from the Ion Xpress Barcode Adapters 1–96 Kit were substituted for the non-barcoded adapter mix in the Ion AmpliSeq Library Kit. Next, the multiplexed barcoded libraries were enriched by clonal amplification using emulsion polymerase chain reaction (PCR) on Ion Sphere Particles (Ion PGMTemplate 200 Kit) and loaded on an Ion 316 Chip. Massively parallel sequencing was carried out on an Ion PGM using the Ion PGM Sequencing 200 Kit v2. The primary filtering process was performed using Torrent Suite v3.6.0 and Ion Torrent Variant Caller v3.6 software. The pipeline included signaling processing, base calling, quality score assignment, adapter trimming, read alignment to 19 human genome references, mapping quality control, coverage analysis, and variant calling. For detection of copy number variations (CNV), nCounter Copy Number Variation CodeSets (NanoString Technologies, Seattle, WA, USA) were used with 300 ng of purified genomic DNA extracted from 2 to 3 sections of 4-μm-thick, formalin-fixed, paraffin-embedded (FFPE) representative tumor blocks using a QIAamp DNA FFPE Tissue Kit (Qiagen, Hilden, Germany). DNA was fragmented via AluI digestion and denatured at 95uC. Fragmented DNA was hybridized with the codeset of 257 genes (Additional file 2: Table S2) in the nCounter Cancer CN Assay Kit (Nanostring Technologies) for 18 h at 65uC and processed according to the manufacturer’s instructions. The nCounter Digital Analyzer counted and tabulated the signals of reporter probes. We used cutoff values of greater than 6% variant frequency and more than 100X coverage to detect true mutational changes in accordance with previous reports and our own experience. Variant calls were further analyzed using the ANNOVAR, which included variant filtering and annotation using the Catalogue of Somatic Mutations in Cancer (COSMIC, http://cancer.sanger.ac.uk/cancergenome/projects/cosmic) database, dbSNP build 137, and amino acid change information. Variant calls from Ion AmpliSeq were further evaluated to reduce potential false-positives. Coverage (> 100X) and quality score (> 30) were considered as filtering criteria. For gene expression data from the NanoString nCounter assay, filtering of samples using quality control criteria was performed according to the manufacturer’s recommendations. All statistical analyses were performed by the Biostatistics and Clinical Epidemiology Center at our institute. The R for Windows v2.11.1 software (R Core Team, Vienna, Austria; http://www.r-project.org) was used for analysis of all data. We implemented the method found in the R “compound.Cox” package. A total of 74 patients with primary tumor samples available were included: 34 patients for UTUC and 40 patients for UBUC (Table 1). Median age at the time of surgery of all patients was 64 years (range, 37 to 83). UC patients were predominantly male (86%), but the proportion of female patients was a bit higher in UTUC than in UBUC (26% vs. 8%, respectively). All but one UBUC had undergone lymph node dissection whereas it was performed in 53% of UTUC patients. In UBUC cohort, more than half of patients (65%) received neoadjuvant chemotherapy prior to radical cystectomy. In all patients, perioperative chemotherapy was a combination of gemcitabine plus either cisplatin or carboplatin, based on the patients’ renal function. There was no significant difference in other clinicopathological features including histology, tumor grade, pathological T (pT) stage, pathological N (pN) and lymphovascular invasion between UBUC and UTUC. Since all tumor samples were obtained at the time of radical surgery, the cohorts lacked early stage, superficial UC. 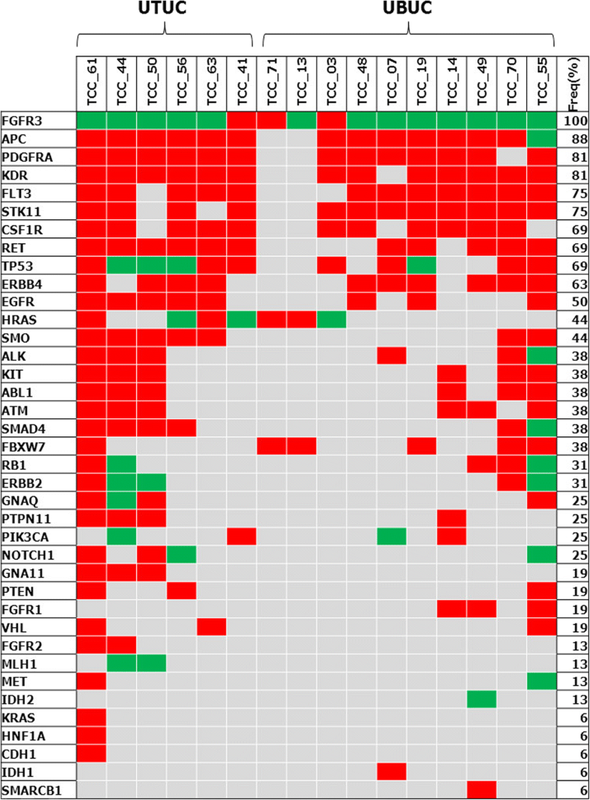 Among 74 tumor samples tested, we found 16 (22%) actionable FGFR3 gene aberrations. Table 2 presents the clinical and pathological characteristics of the 16 patients with FGFR3 aberrations. In addition to 13 patients with FGFR3 mutations, we identified three patients with translocation involving FGFR3-TACC3 (Chr4) which was already considered a promising therapeutic target . There was no significant difference in the frequency of FGFR3 aberrations between UTUC (18%) and UBUC (25%) cohorts (P = 0.444). 31% of tumors with FGFR3 aberrations were of grade 3 (i.e., poorly-differentiated, according to the WHO 1973 classification). Grade 3 and lymphovascular invasion were associated with a lower frequency of FGFR3 aberrations (Table 3). We next investigated other genetic alterations in 16 patients with FGFR3 gene aberrations (Fig. 1). As expected, we found no relevant differences in the incidence of both inactivating and activating mutations between UTUC and UBUC. The most frequently observed genetic mutation was APC, followed by PDGFRA, KDR, FLT3, and STK11. HRAS mutations were found in 7 patients. Interestingly, three of these HRAS mutations were found to be activating, actionable mutations (G12S, G13R and Q61R), unlike the previous study suggesting a mutual exclusion of RAS and FGFR3 . Radical cystectomy is the treatment of choice for muscle invasive UBUC , and radical nephroureterectomy is considered the standard treatment for UTUC . However, the high rate of recurrence in these tumors necessitates novel approaches to systemic therapy. FGFR3 is considered a potential therapeutic target in UC, because recent studies show that FGFR3 activation is an important contributor to tumor development and angiogenesis in UC [17, 18]. Molecular tumor analysis and rational selection of patients are necessary in order to perform clinical trials involving FGFR-targeted agents. The present study demonstrated that FGFR3 abnormalities are present in 22% of patients with UC who underwent radical resection. The majority of aberrations were FGFR3 point mutations. Although UTUC and UBUC have a similar histologic feature, there are epidemiologic and clinicopathologic differences between them . Recently, several studies have reported molecular profiles of UTUC and UBUC [20–22], but controversy remains regarding whether UTUC is biologically distinct from UBUC. This is because, in part, of the relative rarity of UTUC hindering large-scale molecular studies. Our study focused on FGFR3 aberrations in muscle-invasive UC and compared UTUC with UBUC. Compared to previous studies, relatively many cases of UTUB (n = 34) were included in the analysis and the results showed no significant difference in the frequency of FGFR3 aberrations between UBUC (25%) and UTUC (18%). On the other hand, in a study comparing high-grade UTUC (n = 59) with UBUC (n = 102), overall landscape of genetic alterations was similar in both groups, although FGFR3 were more frequently altered in UTUC than in UBUC (36% vs. 22%, respectively) . In a comprehensive study of the genetics of UTUC, whole exome sequencing was performed in samples from 27 patients; FGFR3 alteration was detected in 60% (9 of 15) of high-grade tumors and in 37.5% (3 of 8) of > pT2 tumors . FGFR3 mutations are common in low grade and early stage UCs, while they are less common in muscle-invasive tumors. In a previous meta-analysis for FGFR3 mutations in UBUC, the frequency of FGFR3 mutations decreased with increasing stage and grade: 65% in pTa, 30.2% in pT1, 11.5% in pT2–4 and 69.8% in G1, 68% in G2 and 18.6% in G3 . The frequency of FGFR3 mutations in the present study was infrequent with 18%; it is explained by that in our study, 96 and 73% had pT2–4 and G3 disease, respectively. We identified eight different mutations, including R248C, S249C, and Y373C, which consist more than 95% of mutations from radical cystectomy specimens in a previous study . Preclinical models and early clinical trials suggest that these mutations have sensitivity to FGFR3 inhibitors [18, 24, 25]. Furthermore, we found four additional mutations (N532D, S676S, A797P, and 746_747insG) which have not been reported previously in the COSMIC database (accessed December 2017). Further studies are needed in order to evaluate if these mutations are pathogenic and represent valid targets for anti-FGFR3 therapy. FGFR3 fusion proteins are additional type of mutational events in a subset of UCs with up-regulated FGFR3 expression. FGFR3 fusions with TACC3 and BAIAP2L1 have been reported in UC cell lines and tissues [10, 18]. The clinical relevance of FGFR3-TACC3 fusion in UC has been highlighted by results from preclinical and early clinical studies reporting promising responses to the treatment with FGFR inhibitors. In a phase I trial with FGFR inhibitor JNJ-42756493 (n = 65), five responses were observed; two of them harbored FGFR3-TACC3 translocation . It has been reported that the prevalence of FGFR3-TACC3 fusion in UC ranged 2 to 6% [6, 22, 27]. As the majorities of studies analyzed samples from muscle-invasive cancer, the association between FGFR3 fusion and tumor grade or stage is still uncertain. In our study, FGFR3-TACC3 translocation was observed in three patients (4%): one patient with high-grade tumor and two patients with low-grade tumor. On the other hand, Sfakianos et al. reported that all five FGFR3-TACC3 translocations were detected only in high-grade UTUCs (n = 59) but in no low-grade tumors (0 of 23) . Recent studies have reported encouraging data of FGFR3-targeted therapies in patients with advanced UC harboring FGFR3 alterations. In a phase I expansion cohort study , 67 patients with FGFR3-altered UC were enrolled and treated with BGJ398, a selective FGFR1–3 inhibitor; 70.1% had received two or more systemic therapies. BGJ398 monotherapy was well tolerated and had response rate of 25.4% with a disease control rate of 64.2%. In a Phase II trial of erdafitinib , a pan-FGFR inhibitor, the 99 patients enrolled had a verified mutation in FGFR3 (74.7%) or fusion in FGFR2/FGFR3 (25.3%); 88.1% had received ≥1 line of prior systemic treatment. Erdafitinib showed a response rate of 40.4% and a disease control rate of 79.8%. Responses occurred in patients without prior exposure to chemotherapy (41.7%) as well as those previously treated with chemotherapy (40.2%). These results suggest that FGFR3-targeted therapies may represent a viable strategy for the treatment of FGFR3-altered UC in metastatic as well as perioperative settings. Several limitations of our study warrant consideration. First, the results should be interpreted with caution given the limited number of patients and retrospective nature. Second, analysis using matched normal tissues was not performed. Third, the imbalance in the administration of neoadjuvant chemotherapy between UBUC and UTUC may affect the results, because it is known that neoadjuvant chemotherapy can induce mutational shift [30, 31]. Similarly, it should be noted that previous intravesical therapy may influence the results of mutational analysis in UBUC, although our study included only three patients who had received intravesical therapy. We report that FGFR3 gene aberrations were detected in 22% of curatively-resected UC. The frequency was similar between UTUC and UBUC. Patients with FGFR3 mutations or FGFR3-TACC3 fusion may constitute potential candidates for a novel FGFR-targeted therapy in the perioperative setting. Further studies are warranted to reveal the functional significance of the FGFR3 aberrations and better define subset of patients that benefit from anti-FGFR therapy. The datasets used and/or analysed during the current study are available from the corresponding author, Se Hoon Park (hematoma@skku.edu) on reasonable request. YSK contributed to study design and drafted the manuscripts. KK and SJL participated in data collection and analysis. GYK carried out pathologic review of tissue samples and participated in genetic studies. SHP contributed to study design, data interpretation, and editing the manuscript. All authors read and approved the final manuscript. The current study was reviewed and approved by the Institutional Review Board of Samsung Medical Center. All participants provided written consent to participate in this study.